The aim of the study was to provide detail on food tolerance in young children investigated for suspected food sensitivity. Rather than conducting a single case study it was thought that information on all young children seen in a 12 month period would provide a more useful picture of current practice. 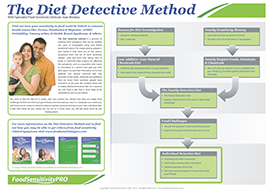 The children were typical of those seen over the last several years in a private practice specialising in dietary investigation. The children presented with a variety of distressing symptoms including eczema, hives, rashes, colic, vomiting, diarrhoea, irritability, and asthma. They had responded to an individualised elimination diet and were reintroducing foods according to instructions. The mothers were sent questionnaires requesting detailed information on tolerance of various foods and environmental factors, and the data was analysed. Cow milk was tolerated in only two, soy milk in three, egg and peanut butter in six, and wheat flour in nine. Fruit was not well tolerated, but some mild vegetables were.A useful guide to which whole foods should be minimised or excluded was found to be intolerance in the infant as well as intolerance in any first degree relative. This group of infants reacted to whole foods often implicated in allergy, additives in foods and paediatric syrups, natural chemicals in food, and environmental factors including smells, the presence of infections, stress and inhalants, especially pollen. It is recommended that dietary investigation be considered in children with the symptoms outlined above. It is suggested that minimising the total body load of all suspect whole foods, natural and added chemicals and environmental factors, allows the most liberal diet possible while providing a beneficial outcome. The interesting full study is now available in the book Fussy Baby in both ebook and hard copy formats.